Mazze updated his project HollyPaint and uploaded his work to Aminet for us. HollyPaint is a brand new bitmap graphics editor (painting application) written in the programming language HollyWood and also uses the MUIRoyale plugin for the interface. It has everything you want from a modern paint program and has a toolbar window, a drawing canvas and has standard support for filters. Because it is written in Hollywood, HollyPaint immediately became available for a multiple of platforms (Aros, Classic AmigaOS, OS4, MorphOS). Mazze also provides the sources and bugs can be reported in the bugtracker. Several things were addressed in this new version. 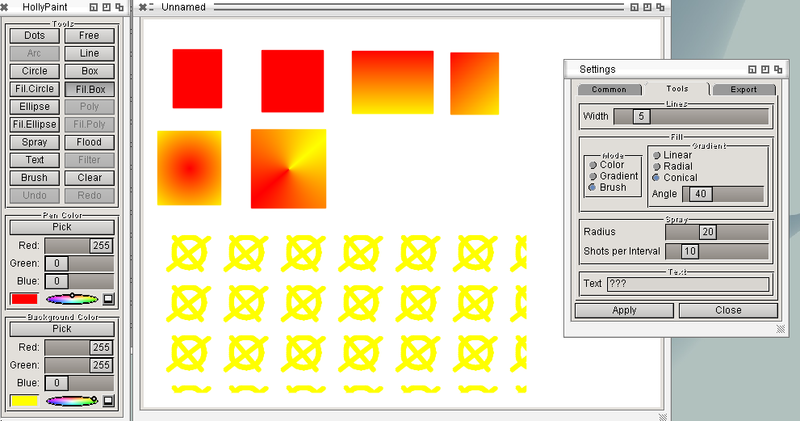 The project is now using the newest Hollywood, some stability issues were fixed, the colorwheel now supports alpha sliders in its own windows, several color-settings now support individual settings, the toolbar window is now resizable, remaining filters were implemented, support for loading/saving transparant brushes was added and other new brush functions were implemented. Several other new functionalities were added and bugs were fixed. More about those (and more detailed descriptions) can be read in the changelog and the readme.